This Sunday there will be 5 coupon inserts in the paper. Included in this is a Target coupon insert but I’ve heard this is going to be regional. Which region? I have no idea but I’ll let you know as soon as I find out! There will be 2 Smartsource, 1 Red Plum, 1 General Mills, and 1 Target . Always double check your newspaper to make sure your inserts are there. I’ve heard a lot of the inserts have been missing from the papers. 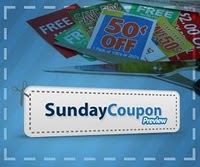 Visit Sunday Coupon Preview for a complete list of coupons in your area. Remember, coupons are typically regional. Also, don’t forget about the other coupon resources. You can print for free from Coupons.com, Coupon Network, and Red Plum! Sunday Coupon Preview 1/1/12…Grab a paper!